GULFPORT, Miss. - (KRT) - The father of the White House press secretary claims in his upcoming book, "Blood, Money & Power: How L.B.J. Killed J.F.K.," that former President Lyndon B. Johnson was behind the assassination of President John F. Kennedy. Barr McClellan, father of White House press secretary Scott McClellan and Food and Drug Administration Commissioner Mark McClellan, is preparing for a Sept. 30 release of a 480-page book by Hannover House that offers photographs, copies of letters, insider interviews and details of fingerprints as proof that Edward A. Clark, the powerful head of Johnson's private and business legal team and a former ambassador to Australia, led the plan and cover-up for the 1963 assassination in Dallas. Kennedy was shot and killed while throngs watched his motorcade travel through Dallas on Nov. 22, 1963. 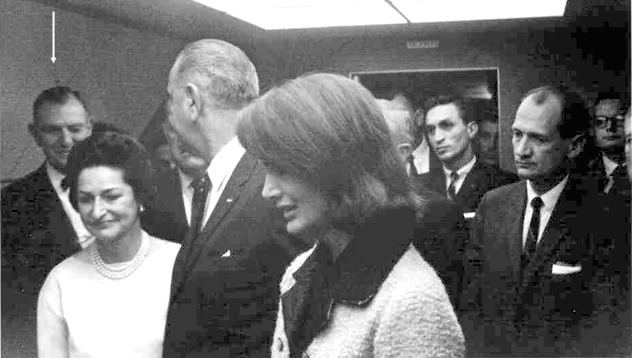 Vice President Johnson was sworn in as president shortly after on Air Force One. "(Johnson) had the motive, opportunity and means," said McClellan, 63, who was a partner in an Austin law firm that served Johnson. The book, McClellan said in an exclusive interview at his Orange Grove home, is about "(Johnson's) role in the assassination. He was behind the assassination, how he was and how it all developed." McClellan and his wife have lived in Gulfport since 1998, where his wife's family lives. McClellan consults for some businesses on the Coast and writes books. McClellan said he includes information in the book that alludes to Johnson's role in the assassination. An example is a story that was told to him by the late Martin Harris, former managing partner at the law firm, as told to Harris by Clark. "Johnson suddenly let Clark go. `That envelope in the car,' he said quietly, almost an afterthought, `is yours.' Stepping toward the car, he muttered, `Put it to good use.' He turned, putting his arms across Clark's shoulders, pulling him along, (and) the two walked toward the convertible. "As they drove back to the ranch, Clark opened the envelope. It contained the policy manual for protection of the president." Barry Bishop, senior shareholder of Clark's former law firm, defended the attorney. McClellan's theory is "absurd," Bishop said over the phone. "Mr. Clark was a big supporter of Mr. Kennedy. The day that President Kennedy was assassinated, there was going to a be a dinner that evening in Texas. Mr. Clark was a co-sponsor of that dinner." McClellan's book is just one of numerous conspiracy theory books that criticize the conclusion of the FBI's investigation of the assassination, that found that Lee Harvey Oswald was the lone gunman. According to the Warren Commission's 1964 report, "Examination of the facts of the assassination itself revealed no indication that Oswald was aided in the planning or execution of his scheme." But that hasn't stopped people from writing books that challenge the Warren Commission's findings. Other ideas about who was behind the assassination include U.S. intelligence agents, the Mafia, Nikita Khrushchev, the military-industrial complex and Cuban exiles. So why should people believe McClellan? What makes his book different? "The big beauty is, (readers) don't have to believe a word I say," McClellan said. "They can believe the fingerprint examiner. They can believe the exchange of memos and letters." "The book is the evidence," said Cecile McClellan, McClellan's wife, who has edited much of the book. "When you read that book and look at those exhibits, and say, `Do I believe this?' There it is It's like (McClellan is) a lawyer presenting this book to the jury. You make your own decision. He's putting it all out there." The theory that Johnson was involved is "exceedingly unlikely," said John C. McAdams, who is an outspoken supporter of the Warren Commission's findings and teaches a course on the JFK assassination at Marquette University in Milwaukee. "What did he (McClellan) find in the documents, and what does it, in fact, indicate? If he's looking at all the documents everyone else is looking at, I would want to know which documents he's interpreting as L.B.J." Eric Parkinson, president of Truman Press Inc., the parent company of Hannover House, said the book comes out at a good time. "Now, 40 years later, it's appropriate that this additional information be brought to light. It (the book) will provide closure for a lot of people." McClellan began working with Clark in 1966 and said he had no role in the conspiracy. But he did hear rumors about it. "When I first started work there and was told that Clark was behind the assassination, I didn't believe it. It was, `This guy you really liked, John Kennedy - he was killed by the guy you're working for now.' I think I went into a bad case of denial." McClellan said he learned of Clark's role several times, from Clark and others in the law firm, including while he was acting as Clark's lawyer. The case involved the 1969 application for Clark to drill an oil well and name it after himself. At the time, McClellan said he asked Clark about the rumors he had been hearing. He said Clark talked in code, but he said, "He wanted the payoff for it. When you mention Dallas, you were talking about the assassination. We had a discussion about it. That's in the book, pretty much verbatim." But why didn't McClellan go public with the information back then? "When you get inside the attorney-client privilege, you find out a whole lot," McClellan said. "At the time I thought everything I learned was privileged. I've since found out that there's no privilege for lawyers who plan crimes," he said, referring to Clark. McClellan said he left the law firm in 1982 because Clark wanted him to represent a company that would conflict with interests of McClellan's other clients. Then, he said, Clark sued him over a personal loan. McClellan counter-sued. Then the bank holding the loan sued. "When I found out what they were going to do to me, I got mad. The gloves came off. I said, `Forget it. They're not going to get away with this anymore.'" But it took years before McClellan was able to publish the book that he said supports his assassination theory. Finally in 1994, the 14-year legal battle with the lawsuits ended with dismissals. By that time, Clark had been dead for two years. McClellan said he was trying to get a book out in 1984, while Clark was alive. "He knew I was going public - from the affidavits in one of those three lawsuits," McClellan said. And he said a book agent he approached in 1984 told him to "do an investigation." "I wanted to be comfortable with what I knew," McClellan said. He said it took a long time to verify fingerprints with several experts and to find a publisher. "A lot of it wouldn't have been available except that old Clark's records" were bequeathed to Southwestern University, McClellan said, making them available for research. Previously "they were stored in his private records. I'm sure if he had thought about it before he died, he would have probably thrown away a few." McClellan had been writing bits and pieces of the book since he left the law firm. He logged numerous hours of research and 10 researchers helped him, he said. Supporters and detractors have talked to McClellan about possible repercussions from the book, McClellan said, but he's not losing any sleep. McClellan said he hasn't had any overt threats. He said people imply retributions, like suggesting that "I'm not going to make it in Austin. `You're going to be out of here.'" McClellan said at least some in his family accept his work on the book. "They said, `OK, I guess that's what Dad's doing now,'" McClellan said. But he said he has not had the chance to ask sons Scott and Mark for their reactions. "I assume that they know about it," McClellan said. "They know what I'm doing. They're not going to comment on it. The oldest, Mark, was then maybe 15 when I left the law firm." When asked if he was concerned for the safety of his twin sons, Dudley, an Austin lawyer in private practice, and Bradley, a Texas state associate attorney general, McClellan said: "The Democrats are pretty much out of power, really, in the state of Texas. So as far as Republicans go, they're in good shape. My ex-wife (Carole Keeton Strayhorn) - she's the comptroller of the state of Texas. There's really none of this influence or anything like that." © 2003, The Sun Herald - Biloxi, Miss.